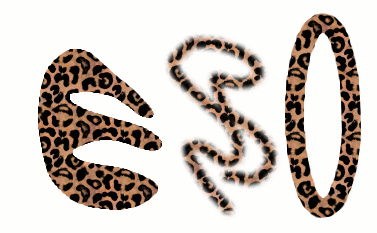 Three ways of using the “Leopard” pattern: bucket-filling a selection, painting with the Clone tool, and stroking an elliptical selection with the pattern. With the Bucket Fill tool, you can choose to fill a region with a pattern instead of a solid color. The box for pattern fill is checked and a click on the pattern shows you all patterns in grid mode. With the Clone tool, you can paint using a pattern, with a wide variety of paintbrush shapes. When you stroke a path or selection, you can do it with a pattern instead of a solid color. You can also use the Clone tool as your choice if you stroke the selection using a painting tool. Note: Patterns do not need to be opaque. If you fill or paint using a pattern with translucent or transparent areas, then the previous contents of the area will show through from behind it. This is one of many ways of doing “overlays” in GIMP. When you install GIMP, it comes presupplied with a few dozen patterns, which seem to have been chosen more or less randomly. You can also add new patterns, either ones you create yourself, or ones you download from the vast number available online. GIMP's current pattern, used in most pattern-related operations, is shown in the Brush/Pattern/Gradient area of the Toolbox. Clicking on the pattern symbol brings up the Patterns dialog, which allows you to select a different pattern. You can also access the Patterns dialog by menu, or dock it so that it is present continuously. The .pat format is used for patterns which were created specifically for GIMP. You can convert any image into a .pat file by opening it in GIMP and then saving it using a file name ending in .pat. Do not confuse GIMP-generated .pat files with files created by other programs (e.g. Photoshop) – after all, .pat is just a part of an (arbitrary) file name. Since GIMP 2.2 you can use .png, .jpg, .bmp, .gif, or .tiff files as patterns. 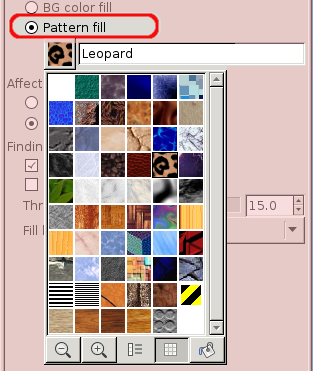 To make a pattern available, you place it in one of the folders in GIMP's pattern search path. By default, the pattern search path includes two folders, the system patterns folder, which you should not use or alter, and the patterns folder inside your personal GIMP directory. You can add new folders to the pattern search path using the Pattern Folders page of the Preferences dialog. 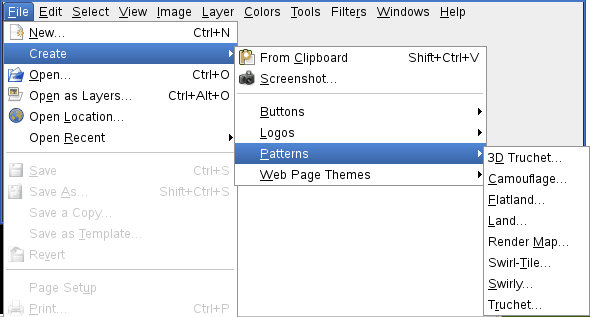 Any PAT file (or, in GIMP 2.2, any of the other acceptable formats) included in a folder in the pattern search path will show up in the Patterns dialog the next time you start GIMP. There are countless ways of creating interesting patterns in GIMP, using the wide variety of available tools and filters -- particularly the rendering filters. You can find tutorials for this in many locations, including the GIMP home page [GIMP]. Some of the filters have options that allows you to make their results tileable. Also, see Section 2.7, “Tileable Blur”, this filter allows you to blend the edges of an image in order to make it more smoothly tileable. Also of interest are a set of pattern-generating scripts that come with GIMP: you can find them in the menu bar, through File → Create → Patterns. Each of the scripts creates a new image filled with a particular type of pattern: a dialog pops up that allows you to set parameters controlling the details of the appearance. 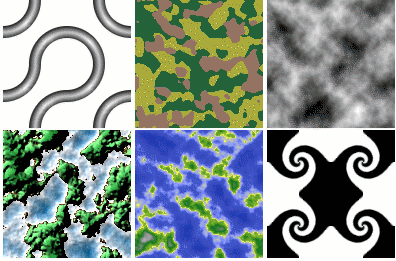 Some of these patterns are most useful for cutting and pasting; others serve best as bumpmaps.